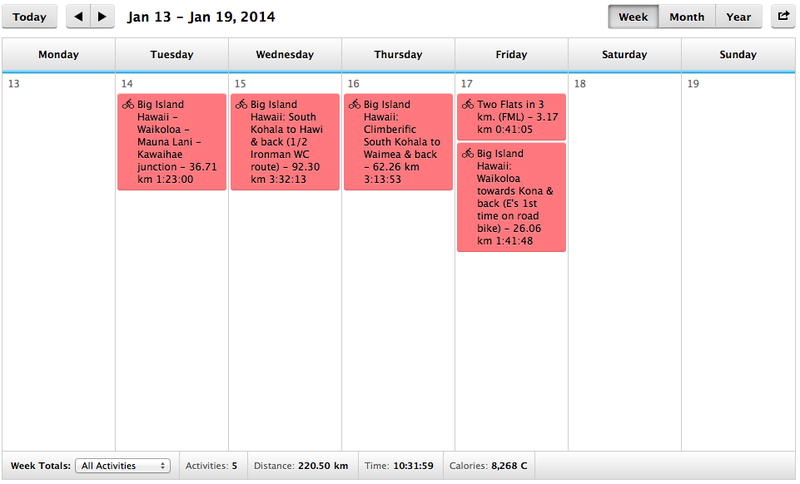 The day after the Waimea climb and a day further past the Hawi near-century, I didn’t have a lot left in the legs. That was totally fine though, and by design, since on this day I was excited to be introducing my wife to road cycling. We had booked a Specialized Dolce road bike for her at Bike Works, and after I rode there to meet her, we’d roll around the resort area and venture out onto the highway for a first-time effort. The day did not begin triumphantly, however; far from it in fact. We all practice (or ought to) changing flats. In highly controlled environments, I’ve changed a flat twice actually. But never in the real world. And so it was, rolling out of the hotel to meet my wife at the rental shop 9 kilometres away, did I notice the road quite a bit bumpier than I’d remembered. Yes, my rear end was more tender thanks to the previous days’ rides, but still… Glances downward revealed that my rear tire was flat. Somehow I’d developed a slow leak overnight (probably thanks to the frequent broken glass on the highway) and by morning it was flat. Real-world tube replacement without the guidance of a professional mechanic is predictably different and more difficult. Not to mention in 30 degree heat and high humidity (not that I’m complaining, though I was at the time). Long story short, I had a replacement kit and all parts; went about removing the old tube and inserting a new one; finally figured out how the mini-pump worked and checked for pinches or misalignments. 40 minutes later I was rolling again – to a washroom to clean up, then towards the highway. A short distance later, and not yet to the highway (a whole 1.5 kilometres from my starting point), BAM! the rear tube ruptured and blew the tire off the rim. My flat-changing skills proved entirely inadequate and as a result I’d just exploded my only spare tube. Frustrated texts and calls to my wife requesting a taxi were reciprocated with a courtesy ride from a friend of the shop manager’s. Thank goodness. Once at the shop and tire professionally fixed (and replaced, as it showed substantial wear and glass penetration), my wife – who’d been ready for an hour – and I set out. We cruised around the Waikoloa resort grounds, allowing her calm roads to get her accustomed to getting on and off the bike seat, practicing starting and stopping, and sorting out how to shift with road bike gear levers. I wasn’t surprised – she’s a natural! She quickly learned the beauty of road cycling – astonished at how far we’d already ridden (and how easily), it wasn’t long before she wanted to hit the open road and go faster. We pulled out, south-bound this time, on the 19 towards Kona. 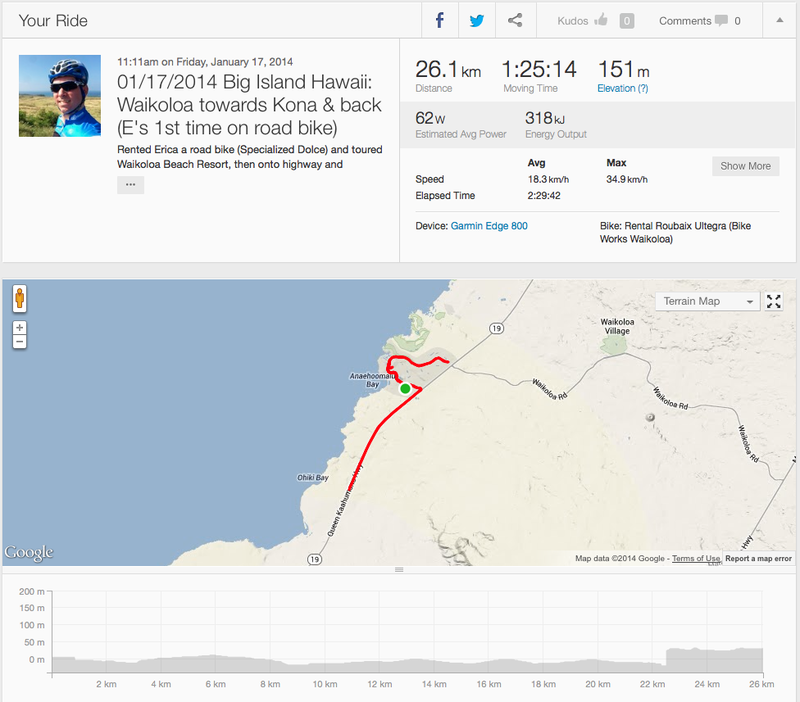 It was a thought to try to get to Hualalai but we soon learned that it was quite a distance away and the mid-day heat was starting to beat down. The ride ended up being a smooth 25 kilometres and we were both happy with the experience. Bikes returned a couple hours later, our Big Island road cycling adventures had come to a close. I was and remain happy as a clam with my opportunities, and save for the flats, entirely satisfied.